A brain injury is defined as any injury sustained to the brain, resulting in internal damage. Brain injury may be caused by a blow to the head (traumatic brain injury) or through infection or virus. Brain injuries can also occur when brain cells are deprived of oxygen, such as during a near-drowning incident, medication misuse or inhalation of toxic substances. Brain injuries can also include other conditions such as brain damage, brain trauma or traumatic brain injury, but generally does not include Alzheimer's disease, alcohol-related effects or the effects of normal aging. A brain injury can result from a number of different causes. The cause of a brain injury usually determines what type of legal claim may be filed. If a person received a brain injury due to the negligence of another, he or she may be able to file suit and recover damages caused by the injury. Medical malpractice: A health care professional can be held liable if their breach of medical care standards causes a brain injury, which can include defective surgical procedures or errors in prescribing medication. Slip and fall accidents: A slip and fall can cause serious injury to the brain, head, neck and spinal cord. Owners of premises may be held liable if they do not fix dangerous conditions on their premises. Dangerous activities: Some sports and recreational activities are dangerous in nature and involve a risk of harm. Car accidents: Motor vehicle collisions are a leading cause of brain injury. This is especially true for motorcycles. Products liability: Defective products can cause brain injury, especially those that are ingested or involve hazardous substances. How Can I Prove Negligence in My Brain Injury Claim? One of the main difficulties in proving a brain injury claim is that the effects of the injury may not appear until a long time after the incident, sometime several years. This is especially true of traumatic brain injury, because they are injuries that are caused by a blow to the head. In the state of Illinois, you have two years from the discovery of your brain injury in order to file a medical malpractice claim. You also only have four years from the date of the negligent act that caused your brain injury to file a medical malpractice claim. It is very important to properly document any injuries soon after they occur. It helps to make a written account of what happened and to keep all medical receipts and reports. Be sure to list important dates, witnesses and contact information. If you are injured, a Chicago brain injury attorney from Nemeroff Law Offices can help you document your injuries and keep track of your medical records and expenses. 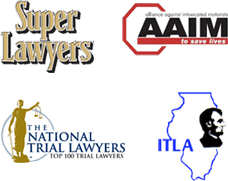 We are here to help you file your claim within the statutes of limitations set forth by the state of Illinois. What Damages Can I Be Eligible For After a Brain Injury? Because a brain injury can leave a person with ongoing medical problems that can affect the ability to work or carry out other daily activities, compensation from the negligent party allows the victim of a brain injury to recover for losses that result from the injury. For example, the defendant may be required to compensate the victim for medical expenses, hospital bills, and attorney fees. In addition, if the injury resulted in a loss of work wages or earning capacity, this may also be figured into the damages award. The effects as a result of brain injury can be severe and life changing. At Nemeroff Law Offices, we help individuals and families overcome these challenges and recover the necessary compensation for medical expenses and future needs. Our firm has an extensive rolodex of qualified experts in many fields necessary to help prove your case, including medical doctors, economists to discuss your past and future wage loss, life care planners to discuss your future medical care costs and many other experts that will help to increase the value of your brain injury case. We offer a free consultation to evaluate your brain injury claim. It will cost you nothing to consult with a lawyer to see if you have a case. Nemeroff Law Offices will act promptly to preserve evidence and investigate the accident as well as the conduct of the responsible party. Contact Nemeroff Law Offices immediately at 312–629–8800 or complete our online contact form.